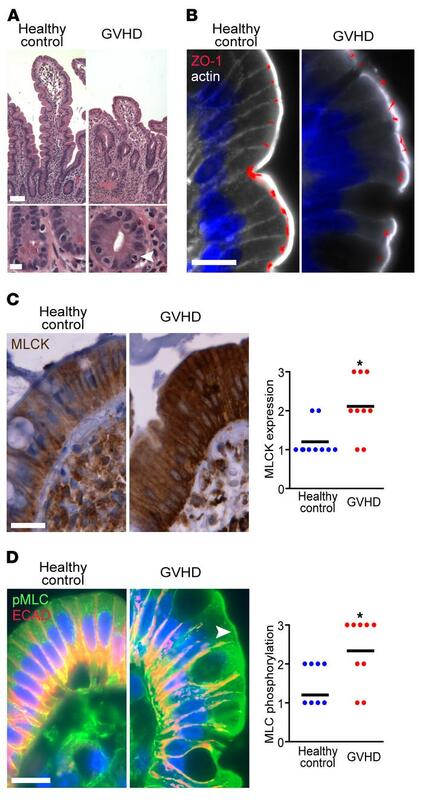 MLCK210 expression and myosin light chain phosphorylation are increased within the intestinal epithelium of patients with GVHD. (A) Representative histopathology of human small intestinal biopsies. Arrowhead denotes an apoptotic cell. Scale bars: 50 μm (top), 10 μm (bottom). (B) Human small intestinal biopsies from healthy controls (left) or GVHD patients (right) were immunostained for ZO-1 (red), β-actin (white), and Hoechst 33342 (blue). Scale bar: 10 μm. Representative images are shown. (C) Biopsies from healthy controls (left) or GVHD patients (right) were immunostained for MLCK210 (brown), counterstained with hematoxylin, and scored from 0 to 3. Each point represents an individual patient. Representative images from n = 9 patients and n = 8 controls are shown. *P < 0.05, Mann-Whitney U test. Scale bar: 10 μm. (D) Biopsies from healthy controls (left) or GVHD patients (right) were immunostained for phosphorylated myosin light chain (pMLC, green) and E-cadherin (ECAD, red). Arrowhead denotes MLC phosphorylation at the perijunctional actomyosin ring. Stains were scored from 0 to 3, with each point representing an individual patient. Representative images from n = 9 patients and n = 8 controls are shown. *P < 0.05, Mann-Whitney U test. Scale bar: 10 μm.